Citizen journalist and persecution target of left wing hate groups and powerful liberal politicos, Mike Strickland is back in the news. But you may not have noticed, because there has been a longtime near media blackout of Strickland’s story: an expose on what happens to you if you put a spotlight on left wing hate groups. At the invitation of a Republican club at one of Oregon’s militantly leftist state universities, Portland State, Mike Strickland was booked as a speaker; but he was silenced by an obscene thug who loudly bellowed and rang a cowbell to drown out the citizen journalist from being heard. Portland State security officers, evidently operating under the same liberal code that emasculates the Portland Police Bureau, stood by doing nothing to allow Mr. Strickland to speak or be heard. The horrific incident made national news. President Trump cited it as another in a long line of outrageous actions taken by violent liberals to block free speech on college campuses of anyone who is not in lockstep with their doctrine of intolerance. Fox News host and veteran talk radio host Laura Ingraham showcased the event on her weeknight broadcast. 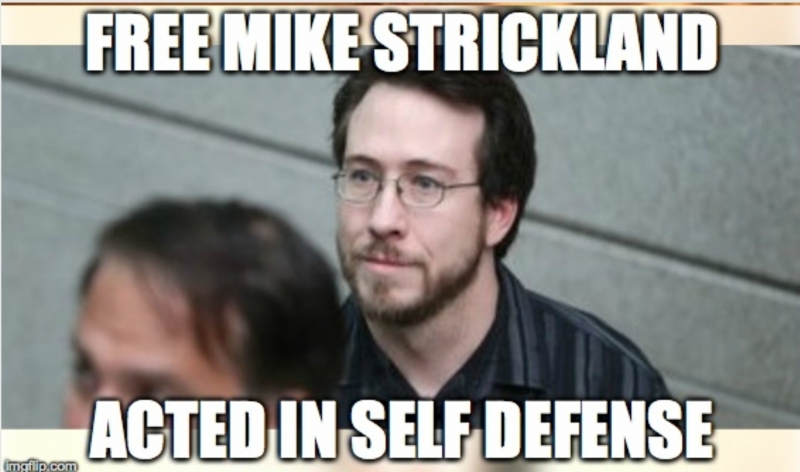 But once again Mike Strickland was neither identified or his story chronicled. Over the years, the citizen journalist who has earned respect telling the side of the story the mainstream propagandists refuse to cover, has broadcast his courageous features on his Laughing At Liberals channel on YouTube. In fact, he was starting to become so effective at airing the stories the left did not want heard; he became a prominent target. He was beaten to a pulp to the point where he was hospitalized; his costly camera equipment was stolen; the local D.A.’s office refused to prosecute Strickland’s assailant even though he had been identified. Strickland continued to do his work undaunted; but fearing for his safety and his life, he legally obtained a permit to carry a gun. This act of self protection turned out to be his eventual undoing. Talk radio host Victoria Taft wrote an extraordinary account of what happened the night Mike Strickland was ensnared in a scenario that would permanently alter his world. Taft has been one of the few to tell the true Strickland story; few have picked up her baton. A pack of violent masked Antifa anarchists plotted to corner Strickland as he videoed a “Black Lives Matter” demonstration in Portland, Oregon. They surrounded him, taunted him, and menacingly moved into his space. He urged them to back off, but the masked harassers kept moving closer and feeling endangered, Strickland pulled his gun to get them to back off. “He has a gun!” they shouted hoping to create mass panic. They succeeded. Strickland was eventually arrested and hauled into the local police office. He was told bail would be set later that night and he would be freed until his trial date. But that was before the politicians realized what a prize they had on their hands… Mike Strickland was about to be taught the price he must pay for exposing the left in a very liberal city and state. The bail was raised to a price Strickland couldn’t afford; he was kept behind bars. He was portrayed in the local media as a gun toting right wing mass murderer whose plan to massacre protesters was fortunately stymied. Eventually, in a kangaroo court, he was convicted of all charges against him. He is appealing the verdict rendered by a Democrat appointed judge. Strickland has a new lawyer; a nationally prominent one who is also representing one of the Covington High School boys who the media propagandists unfairly and falsely portrayed as white supremacist Trump supporters out to attack an elderly native American patriot. You can hear the latest update on the Mike Strickland story as aired on our March 25th episode of The Jayne Carroll Show. For many of us who have covered Mike’s persecution and have had our efforts to obtain national coverage for his amazing story blocked at almost every turn, we are hoping the injustices hurled at him for simply wanting to tell the “other side of the news” will be exposed. And the assault has not been solely in the hands of violent hate groups; there is good reason to believe Strickland was also targeted by politicians and public officials in high places. Yet, no one on the national level has even dipped a journalistic “toe” into the corrupt Swamp that has made a citizen journalist’s life a living hell. Maybe his abuse, by a left wing clown with a cowbell, as security guards stood by and did nothing, will be the incident that opens the eyes of conservatives on the national level that the Mike Strickland story is one that needs to be told. Meanwhile, follow the Strickland persecution on Victoria Taft’s blog. Donate to Oregon Firearms Federation; it was this organization’s brave and principled director Kevin Starrett who eventually pulled together the dollars needed to pay Mike Strickland’s bail. But just like President Trump who keeps fighting back when most would pack up and go home rather than suffer the persecution of the powerful abusers in the Swamp, in the streets, and in the media, Mike Strickland carries on. He is fighting for the truth; he deserves our thanks and our support.